Sunward Steel Buildings, Inc. was proud to manufacture and supply this pre-engineered steel building on behalf of a client in Kilauea, Hawaii, in May of 1999. Currently, the building functions as an equestrian arena on the grounds of Silver Falls Ranch, a unique and pristine special event venue and attraction frequently used for weddings, corporate retreats, family reunions and similar celebrations. 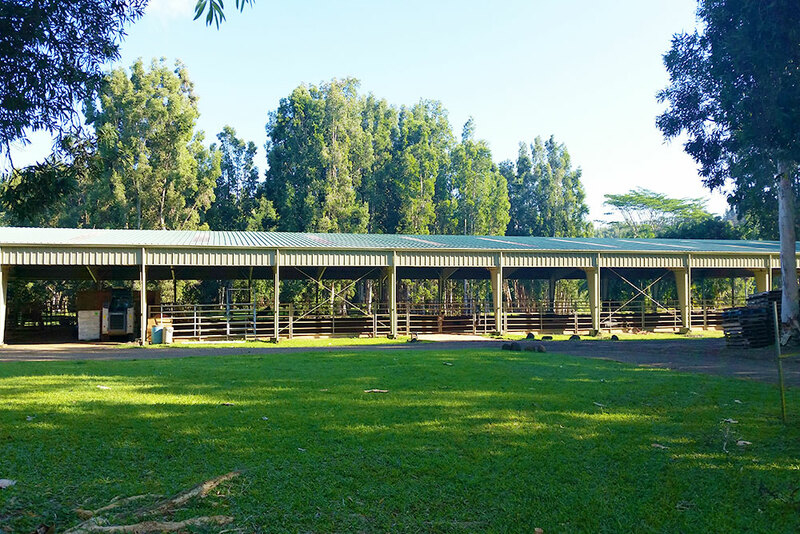 Rugged, economical and built to last, the prefabricated steel arena provides a safe and secure place to ride horses when they aren’t carrying guests through the ranch’s 300-acre serene Hawaii wilderness. Comprised of high-end steel components, this metal riding arena features open side walls and a broad, clear-span design that offers plenty of headroom for riders, and once fully erect, it stands 100’x200’x14’ in size. 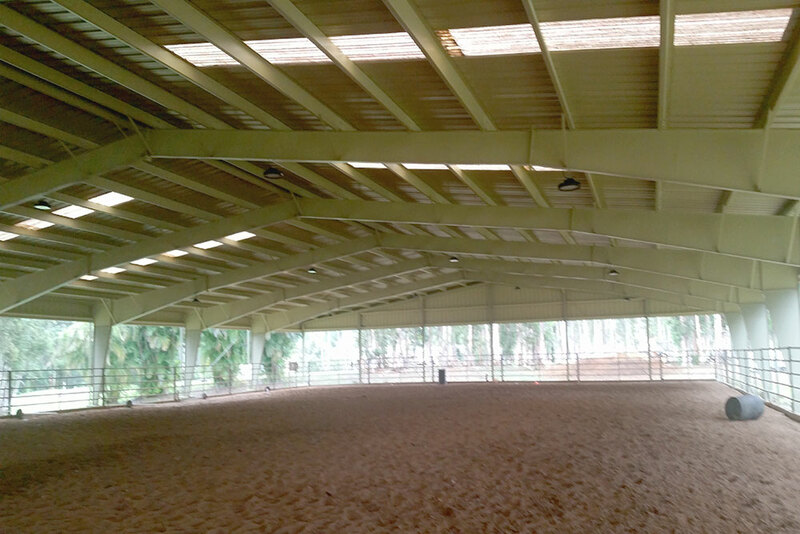 White in color with a complementing, corrosion-resistant Dark Green roof with White trim and a 1.5:12 roof pitch, the metal riding barn gives equestrian enthusiasts a covered space to recreate year-round and a dry place to escape the island of Kauai’s frequent wet weather. A 90-mph wind speed rating is another accommodation made in consideration of the typical climate patterns common across Kauai as well as the building code requirements currently in place on the island. Highly sustainable and designed to hold its own despite heavy rain, strong winds, salt and other Hawaii construction hazards, the steel riding arena offers unrivaled strength and durability in a single, easy-to-erect package. While the waterfalls, natural pool and lush green grounds all draw visitors from across Hawaii and beyond to Silver Falls Ranch, the guided horseback tours available onsite are inarguably one of its biggest attractions. In addition to getting exclusive access to one of the most stunning and scenic areas of the island, all riders get to reap the benefits of exploring on highly trained and extremely well cared for animals. This steel riding arena provides an alternative riding environment for horses and riders looking to escape the rain or otherwise hone their skills in a safe and enclosed environment. An unincorporated community situated on the northeastern shore of the island of Kauai in Hawaii, Kilauea is home to several thousand residents. The community sits just east of Kalihiwai and about 6 miles outside Moloaa Forest Preserve. Considering purchasing a prefabricated steel building for equestrian or other use in Hawaii or another part of the country? Click here for a price quote.